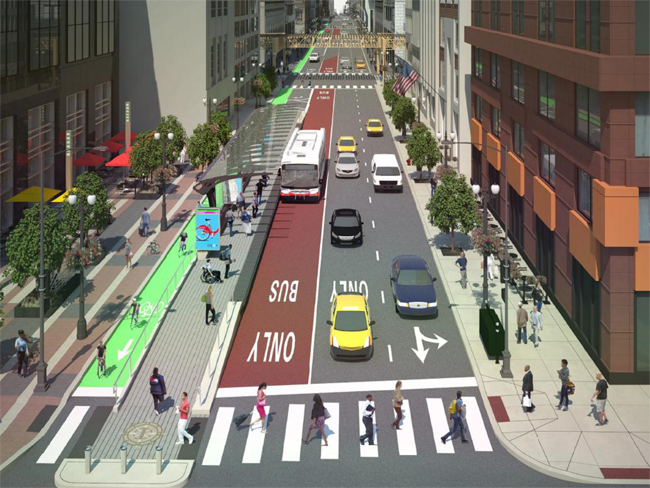 Service will begin in the Loop Link corridor – Chicago’s first bus rapid transit project – on Sunday, December 20, the City of Chicago announced today. The Loop Link is an exciting improvement for the thousands of Chicagoans who ride the bus, bike and walk across the Loop every day. The addition of dedicated bus lanes rightly gives transit riders priority downtown while freeing up space for protected bike lanes and people walking. We urge the city to continue to improve the corridor by adding more features like prepaid boarding that will further speed up service. With the number of people biking downtown growing every year, new protected bike lanes will be added on Washington Blvd. and Randolph St., as well as a new two-way protected bike lane on Clinton St. that’s already being used. The city is installing its first protected intersections at five spots along the corridor, allowing people riding bikes to more safely travel through these high-conflict areas where crashes most often occur. Active Trans spoke with transit riders from neighborhoods throughout Chicago who are excited about the potential benefits of the new additions to corridor. You can see some of their comments below. We’re also helping recruit volunteers to assist with on-street outreach to educate transit riders in the Loop about the project as well as people biking, walking and driving over the next few weeks. Volunteers are needed for 2-hour shifts (7:30 a.m. – 9:30 a.m., 11 a.m. – 1:00 p.m. and 4 p.m. – 6 p.m.) starting Tuesday December 15 through the first week of January. If you’re interested in volunteering, contact Charlie Short at charlie.short@chicagocompletestreets.org or 312-744-8147.